Motorists in passing cars honked their horns in support of the students. But it was not 1969. 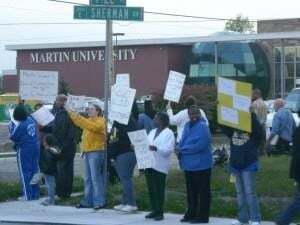 It was just this week at Martin University in Indianapolis. In a series of demonstrations across the street from the school, dozens of students, alumni and a sprinkling of current and former teachers were demanding the dismissal of school President Algeania Freeman. Many protesters, such as organizer Maria Aytes, said the problems started immediately after the university hired Freeman to replace the retiring Rev. Fr. Boniface Hardin, a revered Catholic priest who founded the school in 1977. The school’s goal was to serve low-income, minority and working adult learners. But the demonstrators say since Freeman was hired, professors have been intimidated and fired, students have been harassed to keep silent and a petition drive was started by the school seeking a $5,000 a year increase in tuition. Tuition currently is around $14,000 a year for a full-time student. If ultimately approved, the increase would go into effect in January. “This is just craziness,” said Aytes, a 54-year-old widow in her last semester of seeking a degree in “humane exchange,” which prepares students for contemporary work in human services. Her stated concerns included the treatment of students and staff; the firing of teachers, including some in the middle of the semester; possible cronyism between the board of trustees and Freeman; the tuition increase; and whether the school was moving away from its original mission to benefit minorities and the poor. Police were stationed outside and inside the university building during one protest and would not allow reporters in. University officials could not be reached for comment and calls to the university were also unanswered. One protester was alum Clete Ladd, a principal at Indianapolis Metropolitan High School, which is a charter school. Ladd’s portrait also appears on Martin’s Web site and he is listed as a Martin success story. “All we want is answers,” he said.